When She Said I DoCeleste Bradley Caught in a rainstorm, Miss Calliope Worthington takes shelter in a seemingly abandoned mansion. But when she finds a string of pearls in a dusty chest, she is caught red-handed by the house’s reclusive owner—Mr. Ren Porter—a fiery demon of a man who demands that Callie pay for the necklace…with her innocence.When he first lays eyes on the beautiful trespasser, Ren mistakes her for an angel. But when he realizes Callie is a thief, he strikes a bargain she cannot refuse. She must take his hand in marriage and pay him back in full: one night of passion for each stolen pearl. 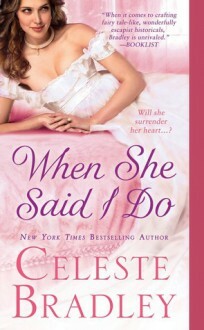 But when Callie surrenders to his desires—night after wicked night—he awakens something deep inside of her. Something powerful and passionate. Like a fairy tale come true, the monster she married has become the man she loves…when she said I do.